The data publishing platform Silk has created a world map depicting the spread of the Ebola virus, which causes the highly deadly hemorrhagic fever. The data-driven view of the Ebola outbreak includes detailed information of the epidemic's history with data from U.S. Centers for Disease Control and Prevention (CDC) and the World Health Organization (WHO). "The latest outbreak of Ebola is the worst ever," Silk's site notes. The current outbreak, which began in March and has lasted seven months, started in Southeastern Guinea -- a first for an Ebola epidemic. As of Oct. 10, it has resulted in 8,376 cases and 4,024 deaths. The outbreak has spread into multiple other countries, most intensely in Liberia and Sierra Leone. Prior to the current outbreak, there have been 34 others recorded since 1976, the first record epidemic. The outbreaks ranged from one infected person up to hundreds, but never thousands as there are today. Today's epidemic has led to a death count that far surpasses the number of deaths of all previous outbreaks combined. 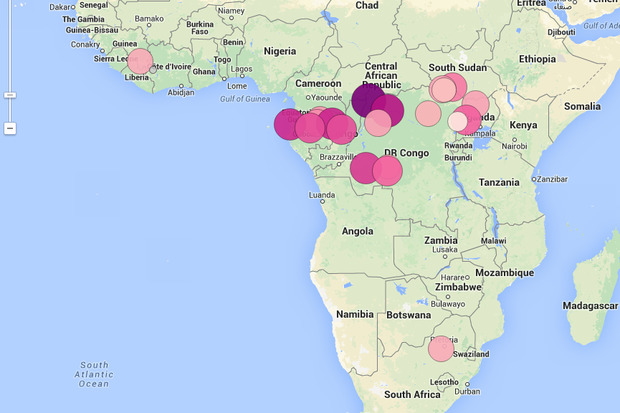 Silk's new page compares other Ebola epidemics. For example, the 1976 epidemic, which took place in the Democratic Republic of Congo (then Zaire), had the highest number of fatalities ever -- 280 dead. The longest-recorded outbreak prior to the current one was in Gabon in 1996; it lasted seven months and resulted in 97 cases and 66 deaths. And the highest number of people infected occurred in 2000 in Uganda, where 425 people carried the virus and 224 died from it. The outbreak with the highest fatality rate (90%) took place in the Democratic Republic of Congo in 2002 when 128 of 143 people infected with the virus died; that compares with the current outbreak's 47% fatality rate, according to CDC data.